Imperial Records was based in Los Angeles and was owned and operated by Robert ‘Lew’ Chudd. He founded the label in 1947. Read a short label introduction here. The Delta Southernaires recorded in 1953 (Cosimo Matassa’s J&M Studios, New Orleans), but the songs (two are known to exist) weren’t released until 10 years later (Imperial 5995). In the meantime they became known as the Spiders, a famous New Orleans doo-wop group. Imperial 5179 was released as by ‘Bro. 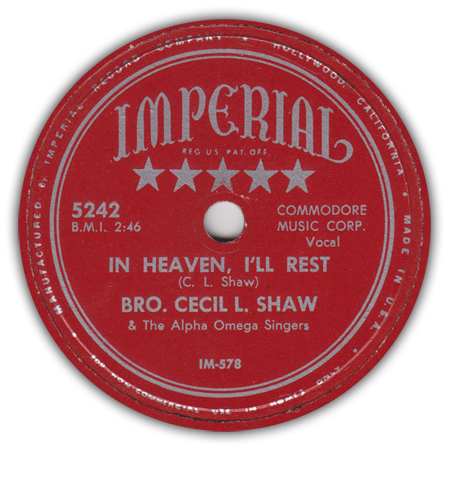 Cecil L. Shaw’ and as by ‘Cecil L. Shaw’ (both with the Union Spiritual Harmonizers). Imperial 5972 and 5994 (Trumpeteers) were first released on Score. The same applies for #5974 (Traveling Four), although the Imperial disc features sides from two different Score discs. Imperial 5053 and 5056 (Silvertone Gospel Singers) were first released on the Radio Artists label. The gospel singles in the 5900 series were all released in 1963 but featured recordings from the late 1940’s/early 1950’s (some with overdubs). The LP by King Louis Narcisse (#9236) was first issued on Veltone LP 3000. LP 9101 (Evelyn Freeman) features more than just gospel songs. The LP by the Soul Stirrers (#94007) was compiled from recordings made for Aladdin and Score. As for the 45’s on Imperial: #5973 reissued a side from Aladdin 2004 and one from #2027, while #5393 reissued the other side from Aladdin 2027 and one from #2035. This discography lists all known Imperial gospel releases (1948-68).